bl.uk > Online Gallery Home	> Online exhibitions	> Asia, Pacific and Africa Collections	> View on the Jhelum. 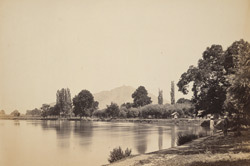 Photograph of a view of the Jhelum river in Srinagar from the 'Strachey Collection of Indian Views', taken by Samuel Bourne in 1864. Samuel Bourne, the bank clerk and amateur photographer arrived in India in 1863 during the early years of commercial photography. Photographs taken during three expeditions to Kashmir and the Himalayas between 1863 and 1866 demonstrate his ability to combine technical skill and artistic vision. These views display a compositional elegance which appealed to Victorian notions of the ‘picturesque’; strategically framed landscapes of rugged mountain scenery, forests, rivers, lakes and rural dwellings. The Jhelum river is the westernmost of the five rivers in the Punjab that ultimately drain into the Indus river in Pakistan. It rises from a deep spring at Vernag, in the Indian-held sector of Jammu and Kashmir state. The river meanders northwestward from the northern slope of the Pir Panjal Range through the Vale of Kashmir to Wular Lake, which controls its flow.